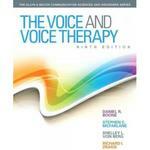 The Voice and Voice Therapy 9 Edition Note: This is the bound book only and does not include access to the Enhanced Pearson eText. To order the Enhanced Pearson eText packaged with a bound book, use ISBN 0133386880. A market leader through many editions, The Voice and Voice Therapy covers both processes of diagnosis and therapy in a comprehensive way, with an extensive pedagogy list helpful to clinician, instructor, and student alike. The Voice and Voice Therapy boasts the most up-to-date evidence-based practice and outcomes assessment and voice therapy facilitation approaches available today, while the comprehensive companion DVD illustrates voice problems in children and adults, as well as methods of relevant therapy, enabling students to see and hear what they are reading about. The Enhanced Pearson eText features embedded video. Improve mastery and retention with the Enhanced Pearson eText* The Enhanced Pearson eText provides a rich, interactive learning environment designed to improve student mastery of content. The Enhanced Pearson eText is: Engaging. The new interactive, multimedia learning features were developed by the authors and other subject-matter experts to deepen and enrich the learning experience. Convenient. Enjoy instant online access from your computer or download the Pearson eText App to read on or offline on your iPad® and Android® tablet. * Affordable. The Enhanced Pearson eText may be purchased stand-alone or with a loose-leaf version of the text for 40-65% less than a print bound book. * The Enhanced eText features are only available in the Pearson eText format. They are not available in third-party eTexts or downloads. *The Pearson eText App is available on Google Play and in the App Store. It requires Android OS 3.1-4, a 7” or 10” tablet, or iPad iOS 5.0 or later.